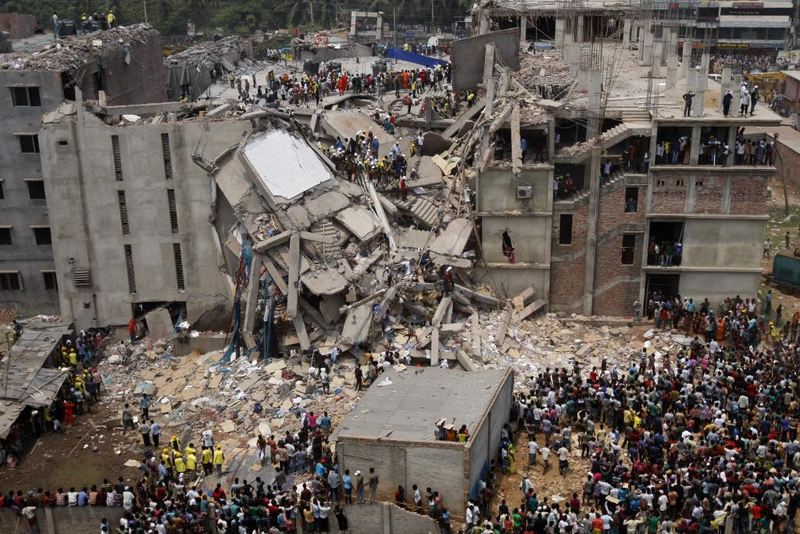 Retailers are still failing to compensate the victims of the disastrous collapse of a garment factory in Bangladesh which killed 1,129 people and left thousands of families injured and without work or money. Christmas Eve marks eight months since the collapse of Rana Plaza Factory in Dhaka, reportedly the deadliest disaster in the garment industry. Despite promises to provide aid in the aftermath of the collapse, 28 major companies are yet to pay long term compensation to the 3,600 families directly affected. So far only short-term emergency compensation has been paid by two of the brands: Low-price UK retailer Primark and Canadian Loblaw. Among the companies supplied by the now closed factory are US giant Walmart, French Carrefour, and UK’s Premier Clothing, according to campaigning organisation Labour Behind the Label, part of the international NGO Clean Clothes Campaign. The disaster drew worldwide attention to the health and safety issues and low wages in the Bangladeshi garment industry, where the current minimum wage is $38 (£23) per month. The collapse is the largest of a number of deadly disasters in garment factories in Bangladesh. It follows the Tazreen factory fire in November last year, in which 111 people were burned to death inside the factory. Newly formed European Accord and US Alliance, is set up by more than 160 international brands such as H&M, Aldi, Primark and Walmart, to ensure improvements to working conditions in the garment industry in Bangladesh. Bangladesh, a country of 160 million people has around 5,000 garment factories employing more than four million, and is the world’s biggest exporter of garments after China.